With the temperatures climbing here in southern Germany and the general lack of in-home air-conditioning, it can be a challenge to find a cool spot in which to relax. 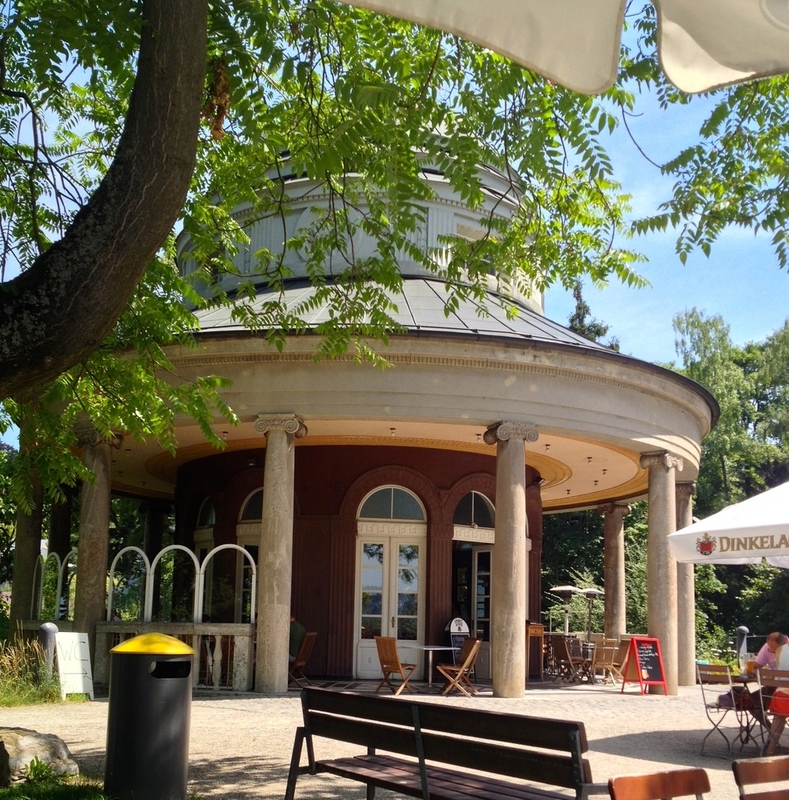 So when it came time to choose a spot for lunch yesterday, my good friend and I opted for the Teehaus (German for "tea house") at the top of Weißenburgpark. Stuttgart is shaped a bit like a bowl. The downtown area is located in the bottom of the bowl, while the rest of the city slopes upward from it. That means that while it might be boiling in the center of the city, it can often be a few degrees cooler along the edges. Weißenburgpark is on the rim of the bowl in Stuttgart Süd, so not only is it a bit cooler, but the added elevation often means it has a lovely breeze to help with the heat. The Teehaus was built in 1913. It's a small, domed building with columns and a gorgeous painted ceiling overtop of the Marmorsaal (German for "marble hall"), adding a bit of old-world elegance to the area. I imagine it must have been a nice retreat for the aristocracy who used to own it. Today there seems to be a lot of public concerts and private events like weddings at the Marmorsaal, but the actual Teehaus is mainly known as a café to the public. There are a few traditional café tables inside the Teehaus, but the biggest draw is the huge patio outside that's under the shade of umbrellas and trees. It makes for a lovely spot in the summertime on the top of the hill, surrounded by green and away from the hustle and bustle of the city. I've been there on many occasions for lunch, for mid-afternoon drinks, and for end of year parties under the string lights of the umbrellas. It helps that the hill affords one of the best views of the city, so you can enjoy a nice meal and a stroll afterwards. The Teehaus has a solid menu, serving a range of drinks during the day, coffee and cake in the afternoon, and traditional German fare during mealtimes. It's a little classier than your traditional German biergarten, and, I would argue, the food is a bit tastier, though you will pay a couple of euros more for it. Yesterday for lunch, I decided to bear the heat with a lovely Hugo - a cocktail made with Prosecco, elderflower syrup, mineral water, mint, and a slice of lime. 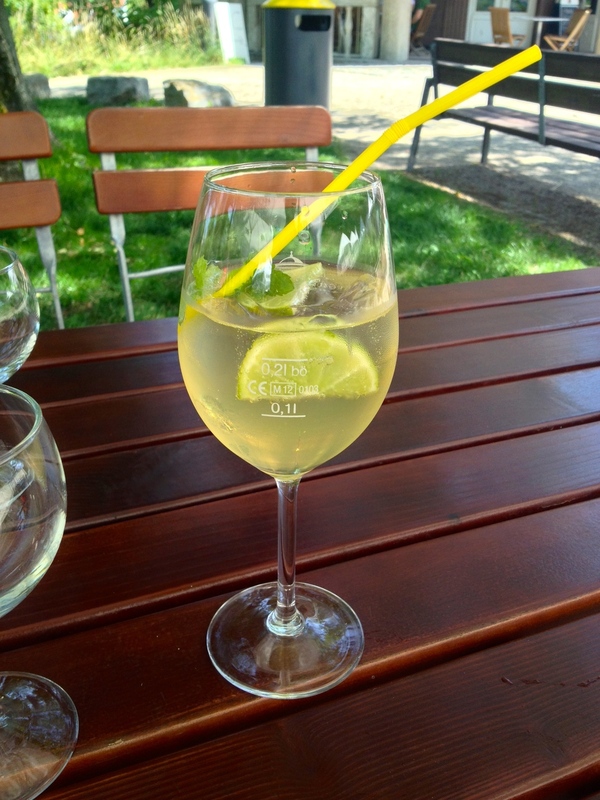 It was one of the tastier Hugos that I've had in Stuttgart, and I liked that the bartender walked out the back door of the Teehaus to pick some fresh mint from their tiny garden for my drink. To eat, I chose my favorite dish of a simple green salad with a homemade vinaigrette and two grilled shrimp skewers with a spicy remoulade. It always seems fresh and healthy, and the shrimp is always cooked just right - tender but not rubbery. The shrimp salad is part of their regular menu, as are several traditional German foods like pretzels and various kinds of sausages, maultaschen (a kind of Swabian ravioli), and linsen und spätzle (lentils and Swabian pasta with two Frankfurters), of which I can wholeheartedly recommend the latter. They also have a rotating special menu that I've generally found to be quite good. When I was there yesterday they had spinach-ricotta ravioli in a tomato sauce and a steak with rosemary potatoes. When we had dinner at the Teehaus with my sister-in-law, she had a tasty special with lamb and ratatouille. Weißenburgpark isn't so much a park as a hill, though there are plenty of green spaces around the hill if you prefer to bring your own picnic lunch while looking out over the city. Just know that to get to the Teehaus or park, you'll have to walk up a moderately steep path from the Bopser u-bahn stop (and back down again when you've finished your meal). Still, I think it's well worth it for the food and view, which is why I like to take our summer visitors there. The Teehaus is open for lunch through dinner starting on the weekends in March or April once the weather gets warm enough, and then gradually throughout the week until October. The patio is often self-service during the slower times, but you will definitely find a waiter on busier weekend evenings. Go for a meal, or just for a stroll and enjoy the panoramic view of the city.